Fourth (4th) and Final - The Language of Flowers Series - Rose Angel -Handcrafted - Dated 1999 - Sculpted by Sue Tague - QX6289. "Roses mean remembrance...." Giving a gift of roses is a charming way to say "I am thinking of you." These lovely flowers also symbolize love, and a single rose is said to reveal, "I love you." The message associated with different flowers today are a legacy from Victorian times. Each flower or plant was assigned a special meaning, so those who knew the code could send secret messages. 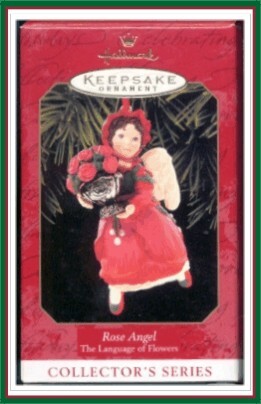 Each angel in this series of Keepsake Collectible Ornaments carries her namesake flower in a sliver-plated basket.